Such occupation, destruction 'routine,' USCIRF report says. 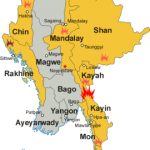 YANGON, Burma (Morning Star News) – Burmese armed forces last month bombed a Catholic church building in northern Shan state that soldiers had occupied earlier in their fight against ethnic separatists, sources said. In a practice that a U.S. government report released last week described as “routine,” the Burma (also called Myanmar) soldiers occupied the church building in Mong Ko, in the country’s northeast near the Kachin state border, in November, as they believed armed ethnic groups would not attack it. After the army retreated, a Burma armed forces jet bombed the church building on Nov. 23-24 to destroy weapons and ammunition the retreating soldiers had left, sources said. The bombing destroyed the roof of the church building and damaged other parts. The Kachin Youth Organization delivers aid and supplies to displaced people in northern Shan state and documents human rights violations in regions where government forces have been fighting armed ethnic rebels. Mong Ko, where the Burma Army also reportedly burned homes and paddies, is occupied by predominantly Christian ethnic Kachin, as well as Chinese, Lisu, Palaung (Ta’ang) and Wa peoples. The aid worker said the Burma Army soldiers began taking cover in the church building while fighting a joint force of four ethnic armed organizations. Officials have not published casualty figures on the area fighting, but local sources reportedly found several bodies in Mong Ko, and some villagers are still missing. Local residents fled, with some displaced to nearby villages and some crossing into China’s Yunnan Province. In total, aid groups say, more than 50,000 refugees in northern Shan state have fled since fighting began in mid-November between the Burma Army and the four ethnic armed organizations: the Kachin Independence Army (KIA), Ta’aung National Liberation Army (TNLA), the Arakanese Army, and the Kokang armed group, also known as the Myanmar National Democratic Alliance Army. Burma Army officials claimed that they took control of Mong Ko in December and urged residents to return home. They also accused the ethnic armed groups of hiding weapons and ammunitions in the church building, but Mai said the KIA would never hide weapons and ammunition in the church building nor let its allies do so. The Burma military routinely occupies churches and summons entire congregations for interrogation, according to a report the U.S. Commission on International Religious Freedom (USCIRF) released on Tuesday (Dec. 13). After more than five years of intensified conflict since Burma violated a 17-year cease-fire in 2011, many Kachin face protracted displacement and are desperate to return home, according to the report. Fighting has also escalated in bordering Kachin state. Burma Army airstrikes and mortar shelling reportedly hit KIA troops as government forces seized KIA’s strategic military base, Gindo post, on Dec. 16. Burma is about 80 percent Buddhist and 9 percent Christian. The government has recognized the special status of Buddhism in Burma and promoted it as a means to consolidate support. The Catholic Bishops’ Conference of Myanmar yesterday (Dec. 18) released a statement saying that they plan to hold a prayer meeting to show solidarity with displaced war victims in Shan and Kachin states on Jan. 1. They aim to pray for 2017 as a year of peace and end the war. They also urged religious groups, including Buddhists and Muslims, to gather and pray for nationwide peace in Burma on Jan. 1 at their respective houses of worship.